An interesting English activity on Proverbs was conducted with the students of grade 7. The students were asked to do a research about English Proverbs and each student had to bring five different proverbs to the class with the meanings and one complementing sentences. It was an interesting activity as all the students had to share their proverbs and sentences by reading them out loud in front of the entire class. The students had to listen and guess the meanings. The activity was thoroughly enjoyed and students were motivated to use a variety of proverbs in their creative writing. 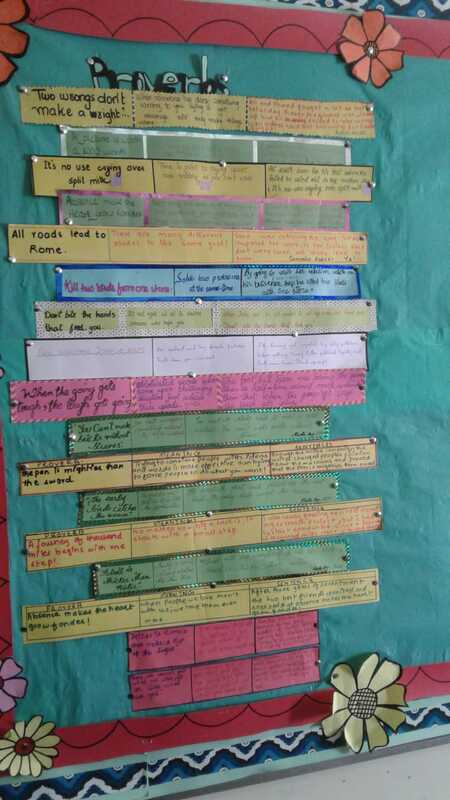 In the last part of the activity students had to cut thin strips of card sheet, divide it in to three columns and write on it the proverb, its meaning and sentence respectively. The strips were then decorated and displayed on the board.